Players from Guadalajara, Mexico City, Queretaro, San Miguel de Allende, Valle de Bravo, Argentina and Europe will compete in this new tournament. 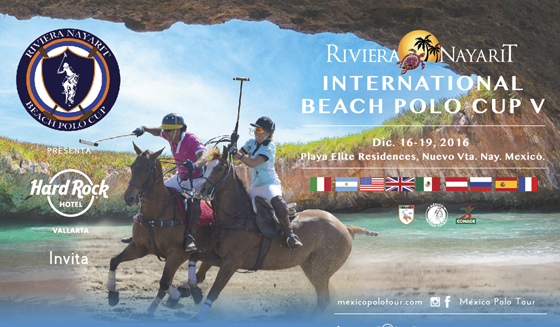 Beach polo is back in the Mexican Pacific with the V International Polo Cup in Playa Riviera Nayarit, which will take place from Saturday December 17th to Sunday, December 18, 2016, at the Elite Residences beach in Flamingos. This event has become very popular within the polo communities of Mexico and the world, as it’s the only one of its kind in the country and one of the very few to take place on the American continent. This month the Riviera Nayarit opens its doors once again to what has been called the “sport of kings” in order to consolidate this international event, which has gained prominence in the world of polo. Players from Guadalajara, Mexico City, Queretaro, San Miguel de Allende, Valle de Bravo, Argentina and Europe are all competing in this year’s tournament. There will be three days filled with events this year, starting on Friday, December 16th with a press conference at the Hard Rock Hotel Vallarta, which has hosted this event for the past consecutive five years. That night the attendees will enjoy a welcome cocktail and the teams will be presented. Meanwhile, the Tucanê brand, which clothes the players, will hold a runway show of their 2017 Spring-Summer collection. On Saturday the activities begin in the water with a morning of enjoyable aquatic experiences presented by Top Sports. At noon the Paseo de los Cocoteros will witness the traditional polo players’ ride through town, a colorful parade that’s rarely seen in the Riviera Nayarit. Later that day around 1 p.m. the beach at Elite Residences will begin to welcome attendees as the games begin. By Sunday at 2 p.m. the games will be ending and the new champion of the most important beach tournament in our country will be named.